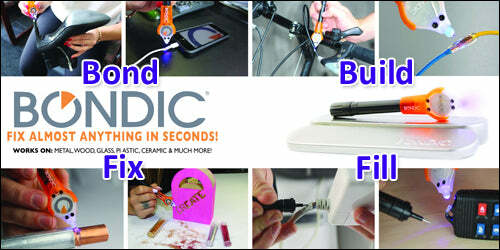 Bondic® - The World's First Liquid Plastic Welder. You will wonder how you ever lived without it! Bond. Build. Fix. Fill. Use it on plastic, metal, fiberglass, and wood. Make sure to follow the Bondic® Principles for best results! Remember it's not a glue so do not use it as one! This is the complete kit, which includes everything you need for curing small projects, including: the applicator, 1 LED UV light and 1 4 gram tube of liquid plastic. We offer the Bondic replacement refill cartridges for when you run out of UV cure liquid. That way, you can re-use the applicator wand. You can also view the product at the bottom of this page. will bondic repair crystal glass?